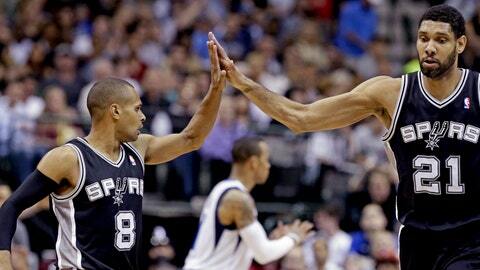 Spurs guard Patty Mills (8) receives congratulations from Tim Duncan. Patty Mills is a shooter no matter when he goes into the game. The San Antonio guard showed it in yet another win over the Dallas Mavericks. Mills scored 26 points starting in place of Tony Parker and the Spurs moved to the brink of the top seed in the Western Conference while likely forcing the Mavericks into a must-win situation with their playoff hopes by beating Dallas 109-100 on Thursday night. Making his second start of the season and seventh of his career with Parker nursing a bad back, Mills had 11 points and a pair of steals in the third quarter when the Spurs turned a two-point deficit into an 11-point lead. "Whether I start or come off the bench, there’s a mentality," said Mills, who fell six points short of his season high on 25 shots — one shy of the most he’s taken this season. "Shooting shots is the same." The Spurs beat the Mavericks for the ninth straight time in the regular season, a streak that has lasted more than two years. Tim Duncan had 20 points and 15 rebounds after leaving briefly in the first quarter because of a hyperextended right knee. Kawhi Leonard added 16 points, a career-high 16 rebounds and five assists. Monta Ellis led Dallas with 24 points, and Dirk Nowitzki had 19. Even with Parker back in San Antonio, the Texas rivals looked like the old playoff foes they are in an entertaining game with both teams trying to lock up their postseason plans. The Spurs are in, and the defending conference champions are just a win or an Oklahoma City loss away from securing the top seed in the West. The Mavericks (48-32) are in a scrum with Phoenix and Memphis — their opponents in the final two games — for the final two playoff spots a year after missing the postseason for the first time since 2000. Dallas is in a virtual tie with the Suns (47-31) and a game ahead of the Grizzlies (46-32). Both opponents have four games in the last six days of the season, with Phoenix coming to Dallas on Saturday night to finish a back-to-back that starts in San Antonio. "Obviously, Saturday’s huge for us," said Devin Harris, who had eight points but was just 1 of 8 from the field. "We’ve got to come out with that type of effort, knowing that our season’s on the line and it’s a game that we must have." The Spurs had a scary moment early when Duncan crumpled to the court holding his right knee and stayed down for a Dallas possession at the other end. When the Spurs got the game stopped with 5:58 left in the first quarter, he headed for a tunnel but emerged a few minutes later and returned to the game. "It really wasn’t that bad," Duncan said. "It just scared me more than anything." Parker missed his second straight game after leaving early in a win over Memphis on Sunday. The Spurs trailed by as many as 28 points and never led in a 19-point loss to Minnesota without Parker, but Mills started in place of Cory Joseph and took over against the Mavericks. Mills had eight points on an 11-0 first-half spurt that lasted just a minute and a half and answered a 14-2 run by Dallas to put San Antonio back in front by five. After Duncan, Leonard and Danny Green keyed a 9-2 run to start the second half, Mills scored 11 of the next 13 San Antonio points capped by a 3-pointer for a 71-60 lead midway through the third quarter. "He’s always aggressive," Spurs coach Gregg Popovich said. "He’s not going to get a whole lot of rebounds or stop a whole lot of people, but he’s going to shoot it. That’s what his skill is. Mills was 6 of 11 from 3-point range, and Green hit three from beyond the arc in the first 5 minutes and finished with 15 points as the Spurs matched their season high with 16 from long range on a season-high 34 attempts. "We just didn’t find them quick enough," Dallas coach Rick Carlisle said. "It was an area that was easily identifiable as one of the big keys of the game." Ellis scored 12 of his 24 points in the fourth quarter with the San Antonio lead hovering around double digits. He was just 5 of 16 from the field through three quarters. NOTES: Nowitzki got a standing ovation during a timeout after a video tribute to him passing Oscar Robertson for 10th on the NBA scoring list in a win at Utah on Tuesday. . . . Actor Tobey Maguire ("Spiderman" and "The Great Gatsby") was in attendance.